During President Donald Trump’s historic trip to Iraq this week, a U.S. soldier pulled him aside. 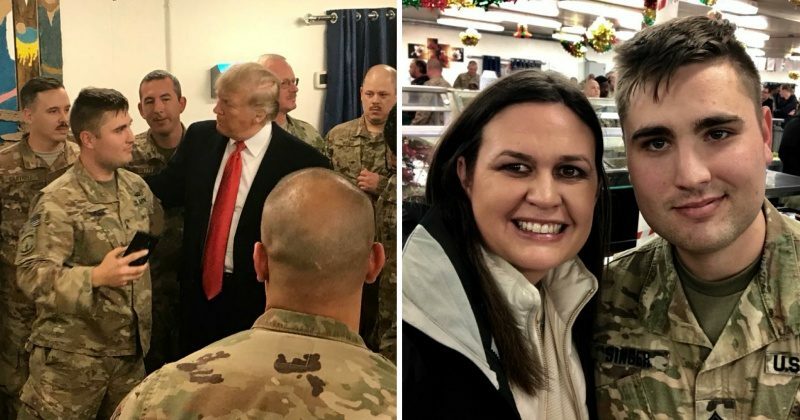 It was White House press secretary Sarah Huckabee Sanders who ultimately revealed the message that the soldier gave the president, and now it’s going viral. The historic nature of the visit was not lost on the troops, and one soldier took Trump aside to share with him a personal story about his own service. Sanders shared the details of the “powerful” moment between the president and the soldier on Twitter. But, of course, Donald Trump is no career politician. He hasn’t spent decades practicing politically correct talking points. Rather, he’s spent his entire life getting things done. He doesn’t care about optics so much as he cares about the men and women who put their lives on the line to protect our freedoms and preserve our way of life. Spread the word about the overwhelming support President Trump has from our troops. The fact that service members are enlisting because of Trump speaks volumes. For the first time in many years, our troops once again have faith in their Commander-in-Chief. You won’t hear that from the mainstream media, though. They’re working overtime to make our president look bad.